The high stability of the INTAREMA technology enables automation processes such as Smart Start or the Recipe Management System, which in turn form the basis for modern Industry 4.0 applications. The new smart applications are the ideal addition to the remote maintenance between customers and EREMA which has been tried and tested over many years. QualityOn: In addition to the previous machine data, specially integrated sensors – the QualityOn package – can be used in future to record and evaluate MVR (Melt Volume-Flow Rate) and colour directly at the machine. The QualityOn package enables recyclers and producers to make their recyclates with consistent quality in accordance with the special requirements of their customers and document the recyclates transparently using online data acquisition and analysis. As soon as the values measured leave the defined tolerance range this is reported automatically. Nonconforming material can be diverted away immediately from the ongoing process. re360: In order to make use of the vast amount of machine, quality and process data in a worthwhile and user-friendly way, EREMA has developed a sophisticated MES (Manufacturing Execution System). re360 is designed not only for EREMA recycling machines but also for film and other production machines in the plastics sector. The system makes sense with just one machine but can also interconnect two or dozens of recycling and/or production facilities around the world. This gives companies who operate on an international scale in particular the benefit of data and production transparency. Spare Parts Online: The extent to which re360 was developed with customer requirements in mind becomes clear with the link to Spare Parts Online, EREMA's online webshop. Any upcoming maintenance work and the replacement of individual parts is displayed in good time by re360. Spare parts can be ordered directly via the online webshop to keep downtime as low as possible. Whether it is typical spare parts such as heating bands, Laserfilter screen discs and cutting knife sets or long-lasting components such as motors or screws – in the new EREMA webshop you can order over 160,000 items at the press of a button. For people interested in PET the recycling system XTREME RENEW is one of the innovative solutions in the sector. How it was created and what are its main advantages? 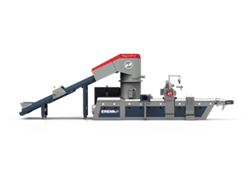 One highlight, especially for people interested in PET, is the new recycling system XTREME RENEW which EREMA has developed together with SIPA of Italy, the leading manufacturer of PET packaging solutions. This accomplishment enables the direct and flexible processing of washed PET flakes to make preforms, signalling the dawn of a new era in PET recycling. What are the other new developments of the company? Participants from the post-consumer sector will be able to judge the convincing benefits of the RegrindPro system for the recycling of regrind material. The advantage over conventional systems: a short extruder screw is enough to melt the already dry and thoroughly warmed regrind particles. The new RegrindPro is particularly convincing in respect of the flexibility of the input materials: PE, PP, ABS, PS or other regrind types can be processed without changing screws. The new ReFresher will also be of interest to the post-consumer sector. This enables you to considerably reduce the – in some cases intensive – odour development in the production of polyolefin pellets. In the field of inhouse recycling, visitors to the show will see the new, direct flow filter SW Direct Flow for minimised contaminants.